Welcome Back! Let's begin with a focus on how teachers can engage with new media and digital tools, strategies and networks. We'll examine the skills and qualities of today's students and link this to recent placement experiences. We'll examine the application of social networking as an essential skill to be a digitally literate educator. The importance of teachers (and students) as 'storytellers' in transmedia spaces will be explored. "Who is this generation of students?" What do students LOOK LIKE, SOUND LIKE? What do they like to do? How do they connect and interact within social networks? FIRST: Compare and contrast the student found in today's classrooms from JK to Gr. 6, as evidenced through your recent practicum experience. Draw this student as a stick person connected to the objects and artifacts found and/or used in the classroom. SECOND: How do students engage in media and digital literacy experiences. Brainstorm all the ways you saw, learned, or applied during your recent teaching practice. ​​Draw these as links to the stick person/student you have already pictured. FINALLY: How do you (or did you) use media and digital resources to connect to information, other educators, each other? Draw yourself as a stick person beside the student, with links to any/all media and digital elements that connect you to the student. Have you met a students like Autumn or Olivia? Not yet? There are many students who see a need and work toward change. They model media and digital literacies in the way they communicate their message of change. What skills and fluencies in media production and digital literacies do you see from these short introductions. LivBit in a Nutshell: Keep Reading, Keep Thinking from TheLivBits on Vimeo. Share your insights from your placement to 'draw a picture' of today's student and their relationship to today's teachers. Share your experiences with student's use of technology and media while on placement. What do you know NOW about the application of media and digital literacy in the classroom? ﻿Post your ideas and comments on the 'wall' provided below. So what skills, fluencies and literacies are evident in today's students? What do you need as a teacher? Let's compare the skills and fluencies from the New Media Literacies, your placement experiences, and the 21st Century Competencies outlined for Ontario students. Scroll down to page 36 in the document Towards Defining 21st Century Competencies for Ontario. What skills and competencies are evident in today's classrooms? HOW? Take a look at this two page document for Ontario educators about Global Competencies. Where are media and digital literacies evident in this document? 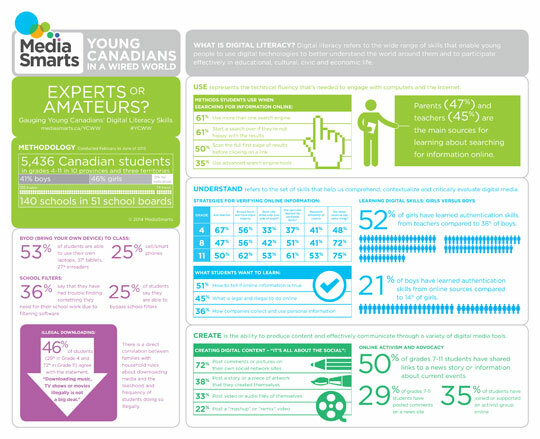 Attribution to http://mediasmarts.ca/ycww for this graphic. Where or how did these media literacy teaching tips fit into your teaching? 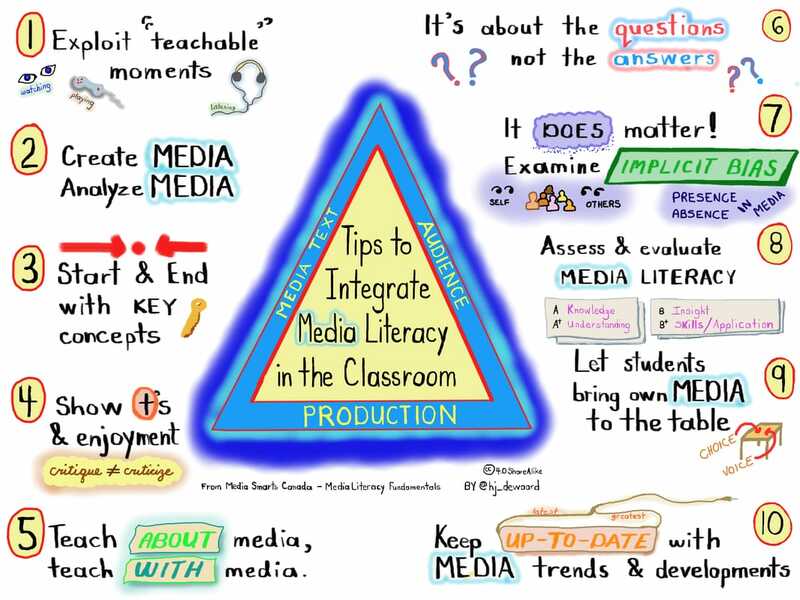 This graphic is a representation of the items found in one of this week's readings: Tips for Integrating Media Literacy in the Classroom from Media Smarts Canada. Social Media creates an opportunity for everyone to be something - a dreamer, creator, advocate, entrepreneur. ​Everyone can apply HOTS (higher order thinking skills) to create their story using readily available and easy to use tools for story creation. History and Herstory awaits every educator who dares to face their fears. Did you know that your presence in social media spaces is a necessary skill as a digital educator? Take a moment to reflect on your fears and how you've overcome some of them. By doing something with media and digital technologies, you become better at doing it, and more comfortable with the shifting sands of digital spaces. FACE YOUR FEARS: Take a moment to think about what will stop you from trying new technologies OR participating in digital spaces. Think about what will stop you from sharing and showcasing your digital and media savvy? What are your fears (fear factor - ed tech style) when it comes to educational technology in general and social media in particular. What would be the top TWO fears for you? Be prepared to explore these in a PEER 2 PEER sharing. ​How do we face those fears? How can you minimize or eliminate the fear factor? What can you do to 'face your fears'? Suze Boss wrote this blog post - Why Teachers Need to Be Great Storytellers. She captures some thoughts about teachers and storytelling. The article focuses on three elements that make 'learning electric'. She reflects that stories can become a 'call to action'. STORY TELLING: Time to explore your story. In preparation for our upcoming digital storytelling activities, take a moment to sketch out your practicum placement story? Think back over the five weeks you spent on placement and imagine the story to be told. Think of the media triangle - text, audience, production, wrapped with the cultural environment of the story. Access a story map template that you may have used or remember seeing (or use this link to find one). ​Is it a hero's journey or a love story? Is it set in reality or fantasy? Who are the main characters? What qualities do these characters bring to the story? How does the story line develop over time? Where does it lead the 'reader'? Remember to 'make it personal', craft a 'changing storyline', and 'ignite' your story with the passion of your placement experiences. For this activity, you will only need paper and pencil technology. You can work alone or with a partner. Ignite your interest in IGNITE! How does this Ignite Talk by Max Ray resonate with your experience? Ignite is .... a global movement built on five minute talks -read more about the fundamentals of IGNITE from this slideshare presentation "What is Ignite: Enlighten us but make it quick! #ignite @ignite"
Ignite does .... put a time and size limit on a story or presentation. Ignite empowers individuals to tell their story, but make it a quick one! Ignite makes you accountable for your story to a real or digital audience. Ignite will .... excite you and entertain you about a topic as seen in this IGNITE by Annie Fetter as she talks about technology and math instruction. Ignite can .... teach you something, tell a story or introduce something new. Watch this IGNITE talk by Max Ray as he convinces you that 2 is greater than 4. How do you connect and share your stories? Do you have story ideas that are unwritten? Do you wonder where your story will come from? What can you do to collect personal story starters for you and your students? Why should you connect and network with other educators using social media. If so, how? If not, why not? How will you begin or what new social media will you try?